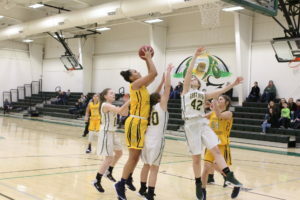 There was a rumble in the Hive as the Yellow Jackettes battered East Hardy in the paint with 17 blocks to preserve a 46-39 victory in the Class A Region II Section 2 Girls Basketball semifinals in Moorefield on Thursday. “I’m proud of all my girls, the ones on the floor and ones on the bench. They’re there supporting, going on the floor and making plays. That’s what it takes for us to win,” Moorefield Coach Paul Keplinger remarked. This was the third victory for Moorefield over the Lady Cougars this season, so third time was the charm to advance to the section and region championships. The Yellow Jackettes will play Tucker County on Saturday afternoon in Petersburg for the Region II Section 2 championship, then the winner hosts Notre Dame and the loser will travel to Trinity Christian for the Region II championship on Wednesday night with a state berth on the line. Moorefield’s last trip to the state tournament in Charleston was in 2003. “This is a chance to win the section championship and keep moving on. We are guaranteed a championship spot to try and go to state. 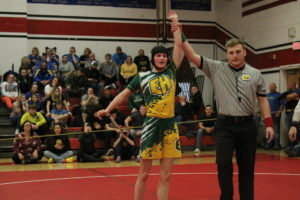 This is something we have discussed all year, trying to get better to this point,” Coach Keplinger noted. 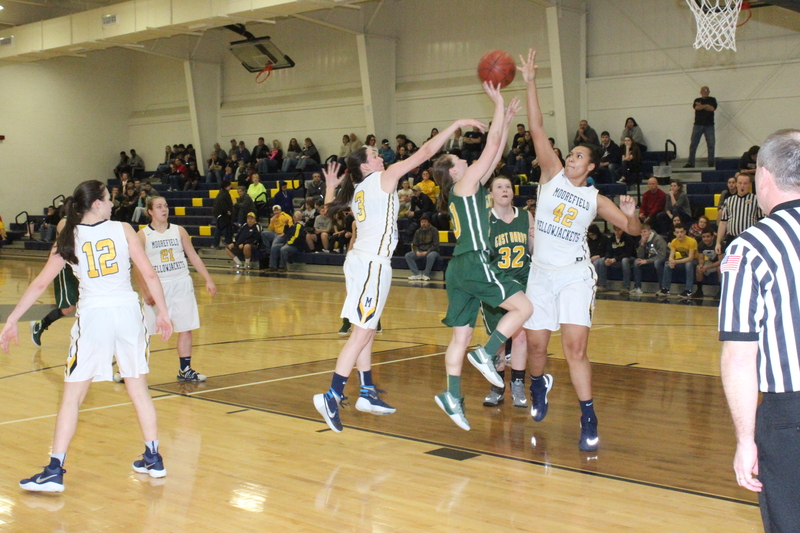 Moorefield center Gianna Fair garnered a dozen blocked shots during the contest to help deny scoring opportunities by the Lady Cougars. 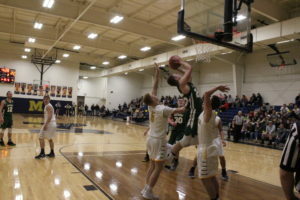 It was certainly rough inside the paint as East Hardy was on the free throw line 37 times during the night making 21 of those attempts including 11 during a late fourth quarter rally attempting to erase a deficit that was as high as 18 points in the third period. The Lady Cougars took the initial semifinal lead after taking the opening tip-off as Julia Hahn nailed a long distance jumper at 7:40 and finished the game with 14 points. The Yellow Jackettes missed their first shot and was 34 percent for field goals on the evening, then East Hardy’s Lexi Strawderman collected the rebound. Moorefield’s Lindsey Rinker stole the ball and scored on the breakaway to tie the game at the 6:43 mark and contributed six markers on the night as the Lady Cougars kept making traps. Rinker snatched a defensive rebound and assisted Madison McGregor on a jumper, her first of a game-high 17 points for the Yellow Jackettes. Both squads drew iron twice before McGregor scored on a short range jumper at 4:53. After a jump ball, Fair blocked her first shot attempt and took the ball off the hands of East Hardy’s Brooke Miller in the process. Moorefield’s Remington Hinkle grabbed an offensive rebound and made the putback for an 8-2 edge at the 4:00 mark.